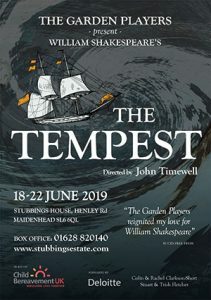 Our 2019 production will be a new production of Shakespeare’s masterpiece, the wonderful The Tempest to be directed by John Timewell. The play will be staged over one week from 18th – 22nd June 2019. Prospero, the true Duke of Milan is now living on an enchanted island with his daughter Miranda, the savage Caliban and Ariel, a spirit of the air. Raising a storm to bring his brother – the usurper of his dukedom – along with his royal entourage, to the island, Prospero plans his revenge. Tickets can be bought online at: www.stubbingsestate.com or by downloading and completing the following booking form.